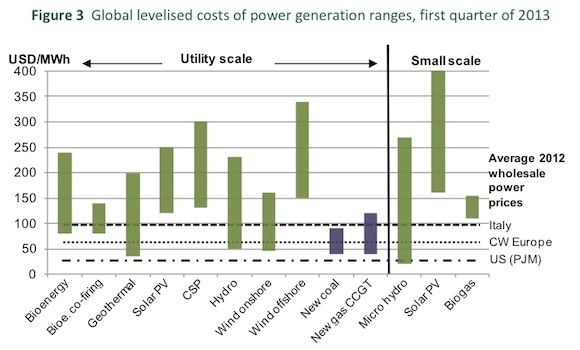 Chris Nelder has an article at Resilience.org which includes an interesting graph of the IEA's view of the Levelised Cost Of Energy (LCOE) for various power sources - Wind to Double and Solar to Triple in 6 Years, Says IEA. With this report, IEA joins a number of other agencies in forecasting that onshore wind and solar PV “have reached, or are approaching, competitiveness in a number of markets without generation-based incentives.” While the levelized cost of generation (LCOE) from renewables is generally still higher than that of new fossil-fueled power plants, the claims that renewables are too expensive or that they can’t compete without subsidies will soon be dead and buried. In Spain, Italy, southern Germany, southern California, Australia, Denmark, and certain other market segments, the LCOE of solar PV is already cheaper than retail electricity prices. In Australia, wind is competitive with new coal- and gas-fired plants with carbon pricing, but only the best wind sites can compete without it. In oil-exporting countries of the Middle East, solar PV is cheaper than burning oil for power generation, because the value of exported oil is so much higher. And so on.